Postcard to Rev. R. B. Layton, Lacombe, Alberta, mailed from Perth, Scotland. 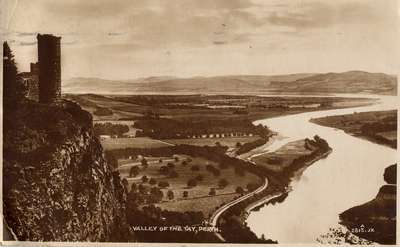 The River Tay, longest in Scotland, originates in the Highlands and flows down to the Firth of Tay, south of Dundee. Well, here I am at last. After spending ten days in London I an now in Perth. Had fine trip across but since I came ... rain, rain!! Hope by this time you are comfortably settled down.